I’d like to thank Jalopnik for the opportunity to share my old-school driving memories, which, as I think about them, were quite unique. Plus, I get the opportunity to share memories that perhaps my son, David, may read about for the first time. The first cars I ever drove were the two family ones that my dad, an Army First Sergeant with 12—soon to be 13—kids, used to haul the family. Those two cars were a 1980 cream-colored Ford Pinto Pony, stick shift, which was a step up from driving the family boat, the extended automatic Ford LTD station wagon. The Pinto was a low rider, but comfortable, with little power. But, it was nice and new and not a bad car to cruise around while growing up in tidewater Virginia. I don’t remember much about the LTD other than that seat belts were not an option; they took up too much space and were tucked away in the seats. Driving came to an abrupt end when I attended the United States Military Academy at West Point in 1981 and later graduating in 1985. What is cool about the Academy is that every cadet earns their wheeled driver’s license on deuce and half trucks. Power steering on a deuce and half truck—dream on. And what a slow, stick shift, loud vehicle. I also got to drive the M113 double stick steering wheel tracked vehicle. As part of the right of passage onto the life of an Army officer, graduates lined up and signed up for loans both to buy class rings and a new car. The coolest cars that cadets bought were the Mazda RX-7, Chevy Camaro and Pontiac Trans Am. I made the mistake of listening to my frugal mom, and bought a four-cylinder, stick, no AC, nothing-automatic Mercury Lynx. It lasted a few Army tours in Germany, plus a few trips out to Fort Sill, Oklahoma. Not your most comfortable ride, and a real embarrassment when it came to driving up and down the hills in Bavaria. After the household went from two boys to four (twins), it was time for the Lynx to become family history; I promptly sold it when military orders came calling. Needless to say, we went on an extended family-van phase, first the 1990 Plymouth Voyager—stick shift, because Dave’s mom, Christine, from Bavaria felt comfortable driving manual cars like most Europeans do. As the family grew, we finally decided on buying a second van, but this time an automatic one. In 1998 at Lawton-Fort Sill, we nearly drove away with a Pontiac Montana van, only to have the sales rep not show up to work. Thank goodness because it was quite cramped if you added the family retriever. So, we drove the gang, by now six boys, up to Duncan, Oklahoma and promptly bought the best automobile we ever owned: An automatic, eight-seat, Chevy Astro, which I reluctantly sold when Christine and I relocated to Germany four years ago after all of our boys had left the household—over 14 years and 200,000 mostly trouble-free miles after we had bought it. It drove wonderfully, had a lumbar-supported driver’s seat, lots of open space and plenty of “me” space so there were few fights in the back on long trips. A really quiet van with lots of power with plenty of room for the dog to lay down without having to worry about being hooked by fishing poles. That said, I still owe you why my situation was unique. You see, as an Army officer, I got to drive or drive shotgun in some cool Army vehicles. My first assigned vehicle was a tracked M113 Armored personnel carrier driven with two sticks and no steering wheel and a ramp in the back to get in and out. Its served as a field artillery forward observer vehicle. And, yes, when I tooled around the German countryside looking for possible artillery positions during the Cold War era along the German Czech border, I scouted the area in an M151 Jeep. The Jeep was easy to repair, but cramped, with really worthless windshield wipers. 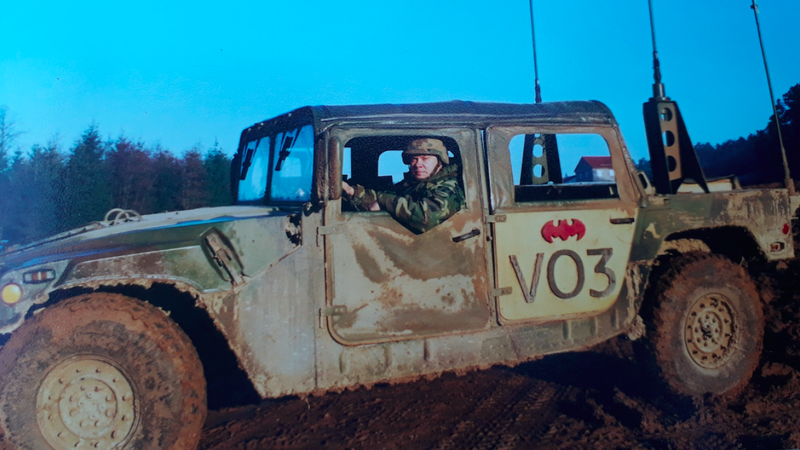 Finally, the coolest thing was having my own Hummer when I was a trainer and evaluator in Hohenfels, Germany, training artillery units in the “Box,” a huge army training area. On one of those trips, I got to take David along. In the photo below, you can see him standing in front of a Bradley Fighting Vehicle. What a cool vehicle that HMMWV was. I felt like Arnold when driving it. The HMMWV, or Hummer, was designed for off-roading and it was great in that role. But, on hardball roads, it was really loud and made driving on German narrow roads tough to do. I like the fact that the seats in the back could flatten and the back could be used as a bed during maneuver exercises. But, trying to stay warm in the winter was a challenge. A heater hose that could be tucked into your coat was a necessity. So, I’ve had some pretty cool driving experiences, and I appreciate Jalopnik and David for allowing me to share them with you.